We have made the decision to remove the AAM and GWO products from PSD website. These were research products, and the scientist who supported the pages has retired. We have no one currently at PSD who can support this activity. You can access the code via this ftp link, however we cannot support the code in any way. Egger J., K. M. Weickmann and K.-P. Hoinka (December 2007): Angular momentum in the global atmospheric circulation. Rev. Geophys., 45, RG4007, https://doi.org/10.1029/2006RG000213. Egger J. and K. Weickmann (April 2007): Latitude–Height Structure of the Atmospheric Angular Momentum Cycle Associated with the Madden–Julian Oscillation. Mon. Weather Rev., 135 (4), 1564-1575, https://doi.org/10.1175/MWR3363.1. Weickmann K. and E. Berry (February 2007): A Synoptic–Dynamic Model of Subseasonal Atmospheric Variability. Mon. Weather Rev., 135 (2), 449-474, https://doi.org/10.1175/MWR3293.1. This quasi-phase space diagram plots standardized anomalies of global relative atmospheric angular momentum (AAM) on the y-axis and global relative AAM time tendency on the x-axis. The anomalies are based on a 1968-96 climatology and are standardized using 5-day average data from 1968-2006. A 5-day running mean is applied to daily data. The 5-day average standard deviation for global AAM is 1.2x1025 kg m2 s-1 and for the global tendency is 1.4x1019 kg m2 s-2. The global tendency is estimated from the global AAM time series using a 4th order (5-point) finite difference scheme. The scheme while highly accurate has problems when 5 points are not available. This and the 5-day running average means there will be changes in the last 4 points plotted when new data are added. The plotting routine was provided courtesy of Matthew Wheeler. The diagram defines one component of the Global Synoptic Dynamic Model (GSDM) described in Weickmann and Berry (2007; WB07). 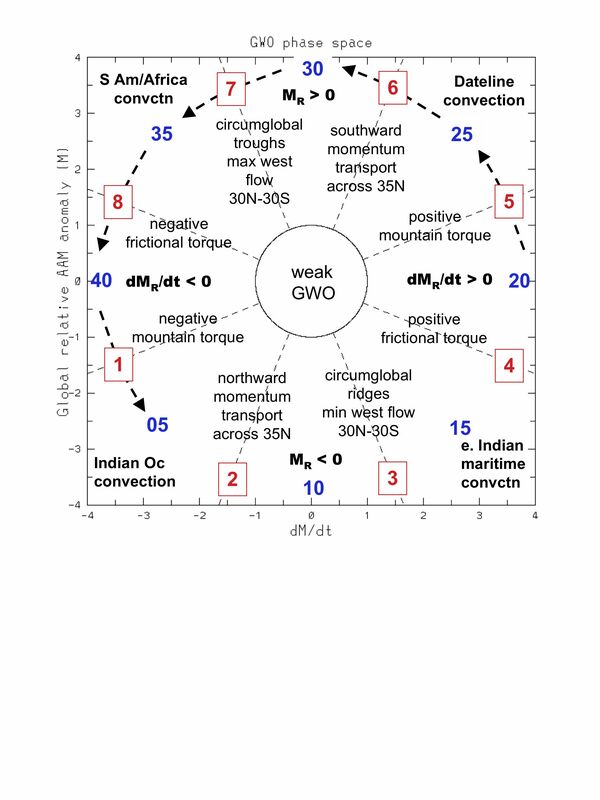 This so-called global wind oscillation (GWO) is introduced in Weickmann and Berry (submitted; hereafter WB08). Another component of the GSDM is defined by the MJO and there is a link to its phase space plot on the webpage. The relation between the MJO and GWO is also described in WB08.